BikeUtah is starting up a Pit Stop Station program which will get more advocates on the ground all around Utah. If you are interested contact the email below. Pit Stop Stations: Taking Cycling Advocacy to the Streets – At Bike Utah we are dedicated to promoting safe cycling and we can’t think of a better way to create awareness for our cause than to engage the community. This spring we were thrilled to kick-start our new Pit Stop Stations program. A “Pit Stop” is a community-based movement to unite cyclists and encourage safe cycling, better legislation, and building a powerful cycling voice in Utah. If you are interested in getting more involved with grassroots cycling advocacy this is your chance. Volunteers will have the opportunity to run Pit Stop Stations throughout the year in any community in Utah. JOIN US on July 11 from 5:30 to 6:30 at the Utah Non-Profit Association offices (231 East 400 South, Ste 345) for Pit Stop Station volunteer training! Please RSVP to Scott Lyttle at 435-901-4191 or slyttle@BikeUtah.org – Space is limited! Quick reminder of an incredible ride that is coming through Provo. Face AIDS is a worldwide organization that is helping with the AIDS pandemic in Africa. A group of volunteers are riding their bikes across the country in the hopes of earning $100,000 to help efforts in Rwanda specifically. They will be in Provo this Saturday (June 30) at 8pm at the Collective (1100W 49N #2) after riding 96 miles from Delta! Once here they are going to be talking about their tour, and their cause. This is going to be a great event, and a great group to support/talk to. There is a recommended $3 donation at the door which will all be given to the riders. Hope to see you there. See the Facebook event here. A large rider base here in Provo is based around BYU campus. A lot of st udents, facility, and staff ride to work/school on a daily basis, and we hear back from them from time to time about their good and bad experiences. 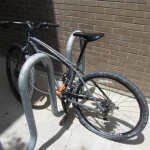 One of the most common issues that we hear about concerning locking up goes two ways; “I was a little late for class today, and locked up in a hurry when I got back to where I locked up my bike was gone! I went to campus police to report it, and they had it. 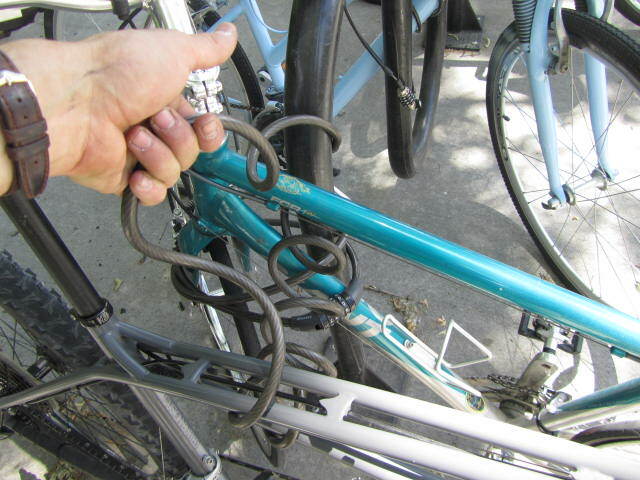 They said that I had put my lock through the bike I locked on top of, and that they had to cut my lock to get the other bike out,” or, “Today I came out of class a little late for work. The racks where packed, and when I unlocked my lock I found that someone else had locked my bike up while locking theirs. I was not sure what to do so I called campus police, and they came to cut the other lock off so I could go.” Now, neither of these situations are verbatim, but they are very common, they may have even happened to you (see the picture at the top). In this final installment we are going to look primarily at how to properly lock up on campus so that your awesome new lock does not get cut. 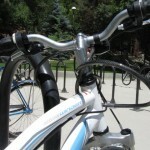 The first thing you need to know about locking up on campus is that YOU MUST LOCK UP TO OFFICIAL BICYCLE RACKS. 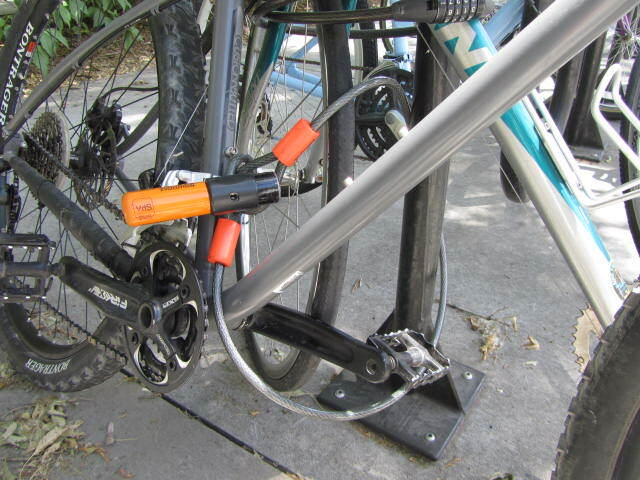 If you lock up anywhere else Parking will come along cut your lock, and take your bike. Granted this is much better than some thief making off with it, but why waste all the time of trying to find out if they have it, and then going to pick it up if you can prevent the whole thing by locking up in the proper place. Racks get full at BYU, it is something that they have to deal with every year, and it is a good problem to have. 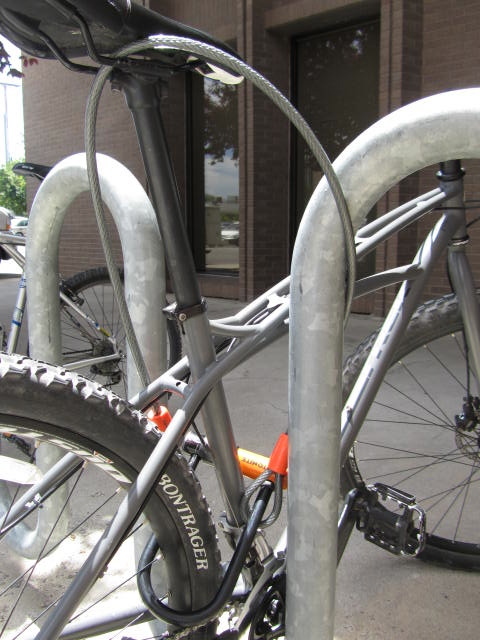 The regular locking techniques we showed in the previous post will work wonders for you while on campus when racks are not overflowing. However, when racks are overflowing their are some special considerations to make. 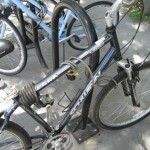 Locking up on top of another bike while not ideal is permissible if you are willing to follow three simple rules. First, make sure there are absolutely no open spots on the rack. 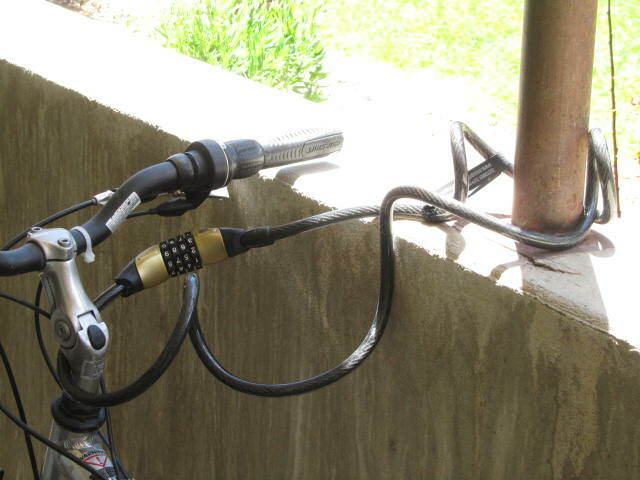 Two, be very gentle while locking up your bike. Even if someones bike does not look like much to you it may be their baby, and scratching someones baby is never nice. 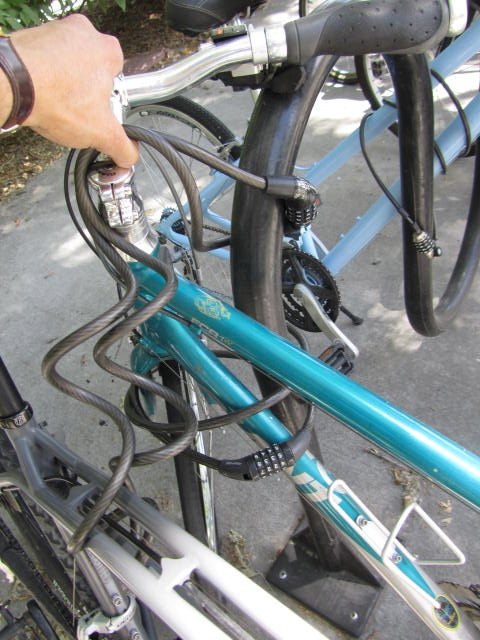 Three, double make sure your lock does not go through any part of their wheels, cables, or frame. Extra lock up security is always nice, but is really only effective if you have the key/combo to the extra lock. I know I said there are only three rules so this last one is a recommendation from the guy who’s bike may be under yours, leave a little thank you note. I know it sounds silly but if you did happen to scratch someones bike a little thank you note could go a long way from you not coming out to flat tires. Check out the pictures bellow on how your lock up should look. Over the top tube. This is one of those times that cable lock is really nice to have. The only down fall is worrying wether a nefarious character will come along and clip it. Under and around for maximum safety. Now that we all know how to lock up properly lets play a little game. When I rode out a few days ago to take pictures for these posts my main goal was to locate the different types of racks and situations you will find yourself in while locking up around town. While I found what I was looking for I also found a few reasons why so many people’s bikes have been taken. Click through the images below, and find the all to common mistakes (front wheel lock is really common). 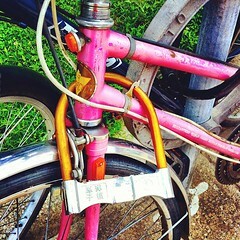 Remember a well locked bike is a happy bike. Ride safe, and lock well. 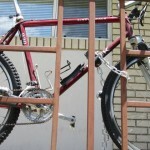 In this post we will be looking specifically at the do’s and don’ts of locking up your bike given the locks we reviewed yesterday. You’ll find if you really think about it that you ride and lock up in the same places a lot. Perhaps your list looks a lot like my list; there is your house, campus, downtown, work, grocery store, library, and 7-11 (it is summer after all). What you will also find is that different amounts of time, and different types of racks are allocated to each place. We are going to try and cover all of these, but first you have to ask yourself what is the most expensive and easily removed part on your bike not including the frame? For most people the correct answer is your rear wheel. 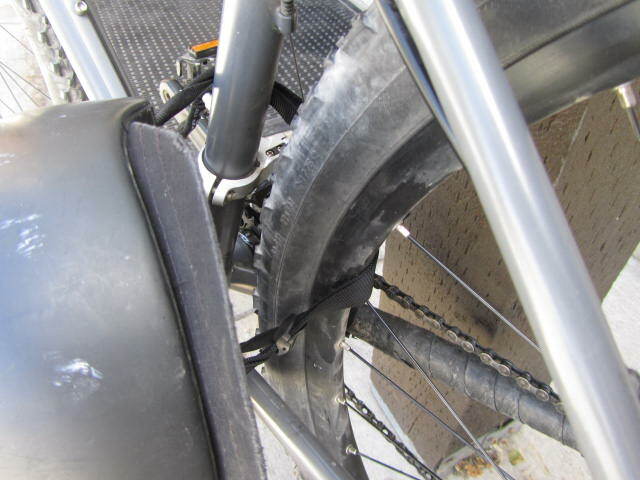 Most rear wheels have a quick release skewer on them (a lever removes your wheel) as opposed to a bolt on rear wheel (bolts hold your wheel on). If this is the case you are looking at a bare minimum of $70 dollars (wheel, tube, tire, gears) to replace a stolen rear wheel. Compare that to $40 dollars for the front wheel, and you see what I mean. As you look through the different locking strategies take note that if the bike is going to be out of sight for a long period of time you want the rear wheel locked up every time. Locking up in a low traffic area where you will be away from you bike for an extended period of time is where you want the most protection you can offer your trusty steed. The following are examples of the strongest ways you can lock up and leave your mind at easy. 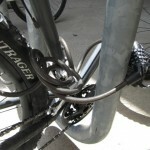 As a reminder a U-lock and accessory cable are the absolute best in these situations. You can see that not only is the frame and precious rear wheel secured but the front wheel is not going anywhere as well. 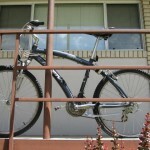 A lot of places you lock up in will hopefully not be super low traffic, and so you can get away with some different locking techniques especially if you will not be away from your bike for a long time. 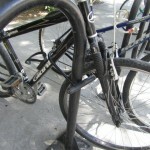 Notice in the picture above that the lock is tangled in the spokes of the rear wheel. 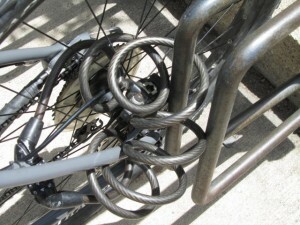 Even if a thief were to come by and try to cut the cable they would have to untangle it from the rear wheel before riding off. This is a great deterrent. 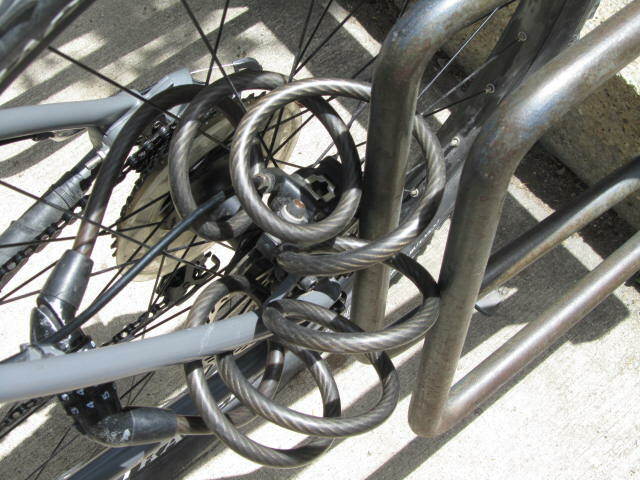 This is the standard way to lock up with your U-lock if you are in a high traffic area. 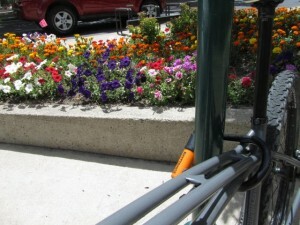 The smaller U-lock does a great job at securing the frame, but the other accessories are ignored. 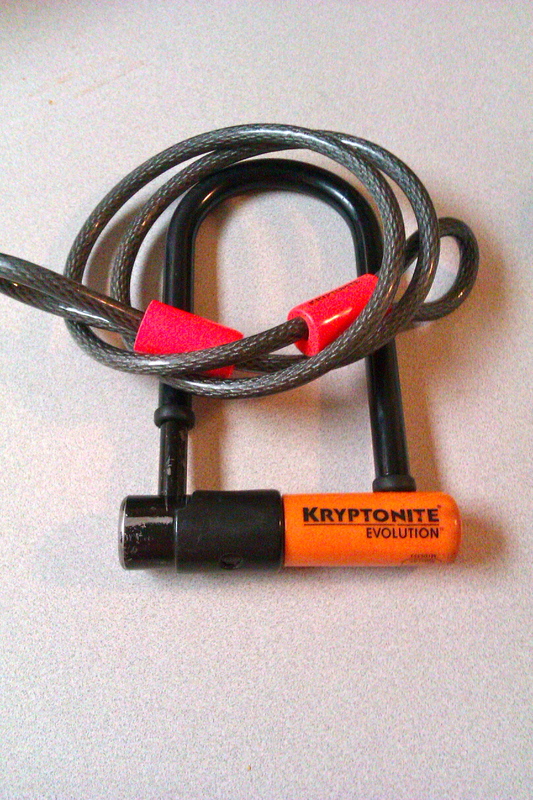 This is why we recommend having an accessory cable if you do go with the handier, smaller, U-lock.Now that we have seen all the standards lets take a look at a variations, and my personal favorite quick locking technique. 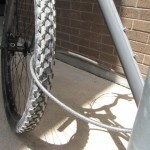 The rear wheel with a quick release is a real concern, and should be locked down whenever possible. 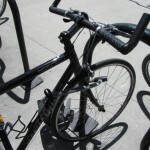 As you will notice in the first set of pictures the U-lock is actually securing the wheel to the frame. 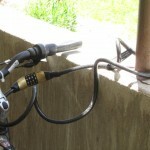 Even if a thief where to clip the accessory cable they would have to carry the bike away. Instead of worrying about that they will simply look for an easier bike (which we hope will not exist, so spread the word about these posts). Are there any other parts of the bike you should worry about? The answer is your saddle. You many not think about it but your saddle and seat post are pretty important to riding your bike, and on the low end cost about $50 dollars to replace. 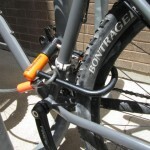 So if you are locking up and you have a quick release seat post consider the locking option below. You’ll notice the rear wheel is still locked and secured. 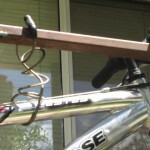 You can do the same thing with just a cable lock as well. 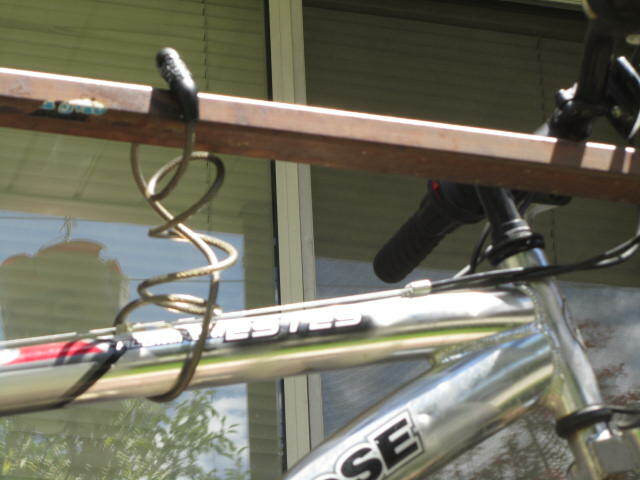 If you are really worried about a stolen seat, which happens a lot, you can always replace that quick release with a bolt from HomeDepot, or your local bike shop. Finally there is my favorite quick locking technique. This technique comes with a serious warning: NEVER USE THIS TECHNIQUE IF YOUR BIKE IS OUT OF SIGHT FOR MORE THAN 30 SECONDS. I use this at restaurants downtown with big window where I can sit and have an eye on my bike, or at 7-11 (which also has big windows), when I am running in for a treat. The technique is very simple, take your helmet and clip it around your frame and rear wheel with the clip facing towards the wall you are leaning up/kickstanding against. 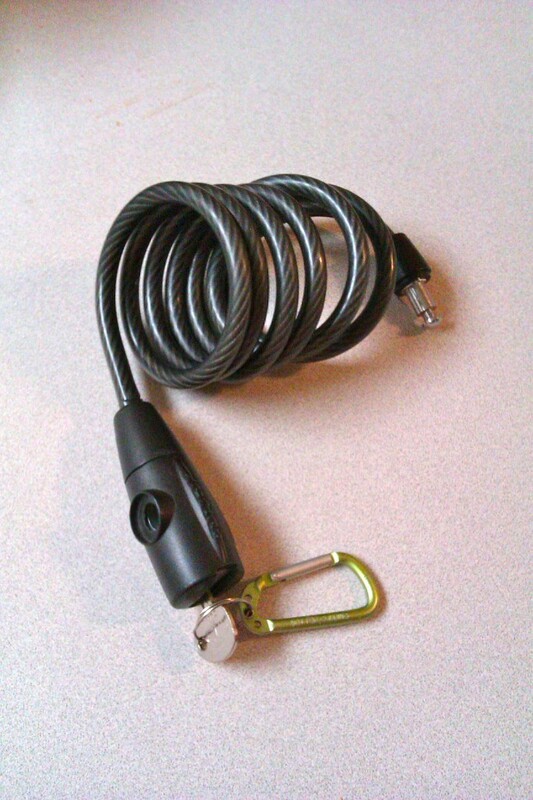 It is that simple and works really well when you do not want to have to fuss with a lock. Check it. Above is the view while ordering my burrito. Quick and easy as long as it is never out of sight. 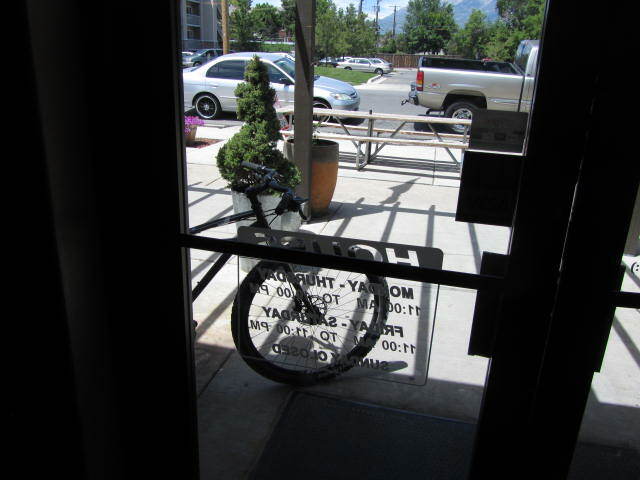 In our next post titled Bikes, BYU, and What The… we will be looking at locking up on BYU campus for all you professors and students, as well as, checking out different ways people in Provo are locking up. 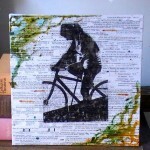 The Provo Bicycle Collective from Trevor Christensen on Vimeo. 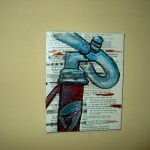 You may have noticed that I used ‘great’ an awful lot in the title of this post, but I could not help it. Trevor Christensen is an incredible photographer who, as it turns out, is also an incredible cinematographer. 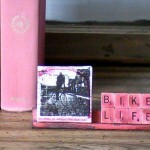 If you have not been to the Collective yet grab your bike and head over to 1100W 49N #2. 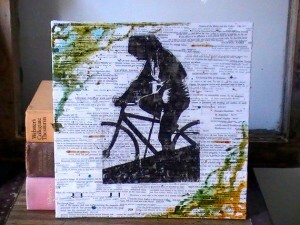 Aside from going in to the shop you can also buy a great piece of bike art with proceeds going to the Collective. Provo really is lucky to have such great resource, and such great people doing great things. 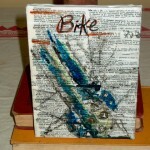 It is always wonderful to see how bicycles inspire people. So many good lines from this video my favorite however would have to be, “And if we must die, let it be riding.” See more at Documentary Unstoppable.